— The Structures of Scientific Revolutions by Thomas Kuhn, published in 1962. Kuhn was the first to offer to concept of the paradigm shift, a concept that has been completely co-opted in our thinking and language. This was the first book I read that laid out the nonlinear nature of scientific research and the role of consensus in establishing a theory. Reading this book at age 17 launched me into a lifetime fascination with the history of science. — A Pattern Language: Towns, Buildings, Construction by Christopher Alexander, published in 1977. Written by an architect, this book became a primer for any complex (and often engineering) task including urban design, software engineering, pattern recognition and yes, painting. This one led to a full shelf of brilliant books by Alexander. — Abstraction and Empathy, by Wilhelm Worringer, published in German in 1907. First exposed to this book by my professor Nan Piene while in college, Worringer’s concepts that two poles in art—abstraction (which at that time was primarily non-Western art) and empathy (European realism in the main)—are both in operation in us. Written before Picasso painted Les Demoiselles d’Avignon or Kandinsky and Malevich explored nonrepresentationalism, this doctoral thesis is deeply prescient and still provocative. It looks like I have a new title to add to my Hall of Fame list. 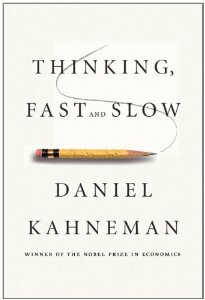 Daniel Kahneman‘s new book, Thinking, Fast and Slow, has that provocative and fundamentally paradigm shifting (thank you Kuhn) power. And what’s more Kahneman has created a vehicle for his ideas that is well written, designed for optimal understanding and irresistibly engaging. Kahneman (who BTW was the first psychologist to win the Nobel prize for economics) offers a model for clarifying our multitude of mental processes and gives the two primary structures names, System 1 and System 2. System 2 is the conscious, thinking mind, the one that works slowly, using reason and analysis. This is our reasonable and thoughtful identity. System 1 is all that automatic and instantaneous processing, the one that has opinions and reactions that may not be logical at all but are part of our pattern-detecting survivalism. System 1 works with whatever information it has and works fast. The fact is we as humans need and use both systems. It is the misapplication of those tools that is the problem. Kahneman takes the reader through a series of exercises that demonstrate how quickly System 1 will lead to inaccurate conclusions. He also shows how the slower more thoughtful System 2 just can’t react as quickly in certain life threatening circumstances as that instantaneous, pattern recognizing System 1. And unlike the arrogance and narcissism inflicted on the reader that has turned so many away from Nassim Nicholas Taleb‘s otherwise fabulous book, The Black Swan, Kahneman places himself right alongside the rest of us in exposing how the human mind is wired to make faulty calls and misreads. We are all bozos on this bus, or so it seems! I am only about half way through the book so there is still more juicy bits coming. But here’s why I am writing about this book prematurely: I am longing to have an in depth discussion with my art making, poetry-writing pals about how creativity calls on both System 1 and System 2. Since reading this book I have tried to observe my decision making in the studio, to track the play of these two impulses. I have a sense that being more observant of those flips and switches could lead to new ways of working, new ways of seeing my work as it unfolds. So yes I would love to explore that territory with Maureen, Nancy, Pam, Marcia, Altoon, Andrew, Thalassa, Alaleh, Lorrie, Luke, Walter, Holly, David, or you. More on this for sure. Thanks Deb, this looks like a must read! Ordering the book right now. thanks. Jim may already have this book. I’ll have to check. Three of my life altering books were The Spectrum of Consciousness by Ken Wilber, Carlos Costenada’s Teachings of Don Juan and more recently the poetry of Pablo Neruda. The creative process is always a flux between impulse and analysis. Too much of either is limiting. Every artist uses their specialized life-built balance between System 1 and 2, but probably best not to over intellectualize while in the flow. Thanks for finding this compelling. And Maureen, given the high overlap of titles in our libraries, of course I would guess Jim has already read it. Thanks for your list Paul. The Wilber is so massive and so far reaching. And anyone raised in San Francisco in the 60s (as I was) also loves Castaneda. And how cool that Neruda is on your list as well. I’ll take your invitation to read the book and report back. My personal ranking for books about the brain/mind extends from Freakonomics at the bottom end, a popularization of parlor tricks, to Consciousness Explained at the top, by the Tufts philosopher, Daniel Dennett. Dennett’s 1991 book, along with his other writing, is intellectually thrilling and attempts big things, stitching together a theory of mind that encompasses behavioral science, biology & evolution, computer science, and philosophy. He would be my candidate for a paradigm shifter, though perhaps mine is the only paradigm he’s shifted. I’ll try Kahneman. My instinctive (System 1?) response is to say that I don’t see any distinction between what we already know about how the subconscious (and unconscious) mind works — think of, say, PTSD flashbacks (System 1?) versus the Conscious Mind, the rational editor (System 2?). I know there is a lot to reject about Freud, and I am far from a Freudian, but sometimes someone comes up with some really great ideas that can’t be improved upon and Freud managed that with the conscious and unconscious distinction. Since I see the name Holly in your list Deborah, I thought I’d add my two bits. As a visual artist (I assume writers follow a similar trajectory) I find myself weaving between these two systems of thought, trying to satisfy something that is totally intuitive and unknowable, and then stepping back and analyzing what I’ve done. In analyzing I’m examining the formal elements and thinking of changes that need to be made to make the painting work, to satisfy that intuitive urge. In this frame of mind I might also try to find words for what I think I am wanting, but always find I can get only part way there. I’m a poet who found your post Googling “poetry” and “System … Daniel Kahneman.” I have just started the book (at page 65) and had a similar response as you did. I am keenly interested in using my System 2 brain to look at my own poetry and see if I can enhance what my System 1 brain has been doing, or not doing; same with my System 2 brain. Fascinating stuff. I am so excited by the ideas and possibilities and surprises I have already found. I also enjoy how he writes. Not at all stuffy, but loads of meat and juice. Kahneman tabulates and categorizes various mental shortcuts by which our brain handles information and directs the organism’s response to its environment. He loosely organizes these mechanisms into two systems, as have many others writing on the mind and in rough correspondence to the universal intuition of a mind-body duality, and he hints at origins in species evolution. But his treatment remains inherently superficial given his apparent choice to confine his study to the observable. He does not seek to locate mental activity in biological structures or explore metaphysical dualism. As a result, he fails to directly address the one question which most matters (to me): what distinguishes brain from mind? and although Kahneman gathers a great deal of superb data that bears on this question, he himself has nothing to say on the matter, as if fundamental issues of spirit were inherently beyond the reach of science. After writing this, I came upon a review by Freeman Dyson in The New York Review of Books, roughly along these same lines: Cognitive illusions are the main themes of the book. A large part of the book is devoted to stories illustrating the various illusions to which supposedly rational people succumb. Notably absent in Kahneman’s book is the name of Sigmund Freud. The Ego and the Id describes two levels of the mind that are similar to the System One and System Two of Kahneman. Kahneman’s method is to study mental processes that can be observed and measured under rigorously controlled experimental conditions. Since strong emotions and obsessions cannot be experimentally controlled, Kahneman’s method did not allow him to study them. The part of the human personality that Kahneman’s method can handle is the non-violent part, concerned with everyday decisions, artificial parlor games, and gambling for small stakes. Violence and passion are the territory of Freud. Freud can penetrate deeper than Kahneman because literature digs deeper than science into human nature and human destiny. Religion is another large area of human behavior than Kahneman chooses to ignore. Andrew, Thanks for your thoughtful response. I wouldn’t take a counter position to what you have written (except to say I have never found Freud anything other than irritating, but I’m a woman so that response is understandable). The book doesn’t go philosophical or deep, as you have pointed out. But there is so much in his construct that I have found useful and insightful, and I think about it many times every day. I think of this book as a really great sports car. No, it doesn’t have a snow plow attachment and it isn’t good on the all terrain trails. But it is really fun to drive.